When people talk about being a "good person," they always seem to grade themselves on a curve, because -- to most people -- the term "goodness" is subjective. Good compared to whom, we wonder? Compared to Mother Theresa, you probably wouldn't consider yourself a good person. But compared to Bill from accounting who steals your lunch from the fridge every day and spends a lot of work time on Facebook... well, compared to him, you're a saint. What I've always appreciated about Once Upon A Time is that, unlike a normal fairytale, it recognizes the fact that people are complex and layered; people are good and bad and it's usually difficult to relegate someone to one box or the other. "The Apprentice" focuses on a few different genres of the characters we see in Storybrooke and the Enchanted Forest: the pure-hearted good guys (Anna); the reformed villains (Hook), and those still classified as villains (Rumple, Regina) and tackles the idea of whether or not you can ever really change your ways. "The Apprentice" is an important episode for Hook and Emma, as it finds the pair embarking on their first date, prompted by Emma Swan herself. This is the first significant moment of the episode, to be honest. We have seen HOOK pursue Emma. We have seen HOOK make moves and wait around and (occasionally) follow her like a lost puppy. But this episode marked the first time that Emma has pursued Hook intentionally. And it's actually quite wonderful because it brings out a new layer to Emma -- a softer, more vulnerable one. On their date, Emma literally strips away the very things she's used for comfort over the past four years: she removes her signature leather jacket in favor of a gentle, feminine dress. Nothing is more symbolic than that in order to demonstrate just how open and trusting Emma is now around Hook. (Which will make what I discuss in a bit all the more painful to endure.) This is a woman who, just the episode prior, noted all of the men in her life who have been taken away from her with hesitancy and guards still up as high as the ice wall that surrounds Storybrooke. But something happened in a very short amount of time, and that something is that Emma realized who Hook was -- she saw that he was a survivor. But it was more than that, really. She saw that he was a fighter. He had fought for her for so long, despite the fact that she kept pushing him further away at every chance. 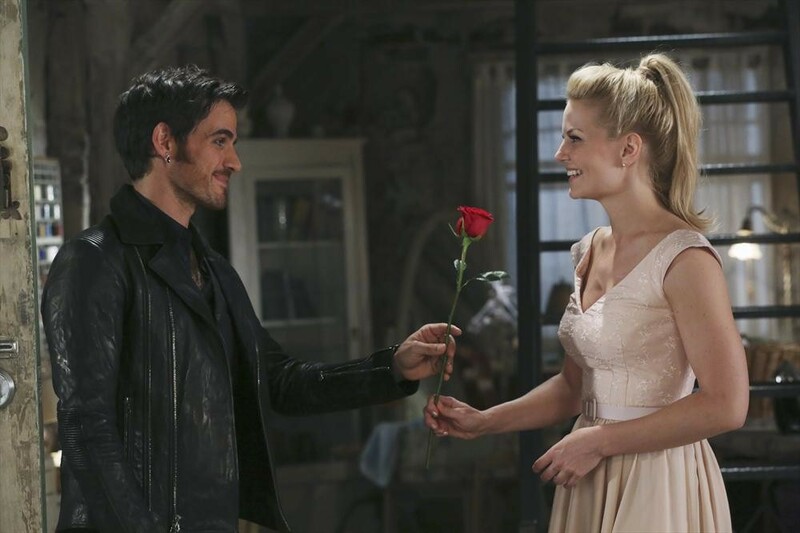 Hook always returned for Emma and now, in "The Apprentice," we see that Emma is willing to start fighting for him. So she asks him out on a date and he says yes and they prepare for a lovely evening to themselves. But there is one thing that Hook wants to do: he wants to retrieve his hand from Rumple first. He's waited for a very long time for the love of his life to pursue HIM and he wants to make sure that everything about the evening is perfect. If you pause to think about it, everything that happens in the episode could have been avoided by Hook just accepting his hook and moving forward with the date. But he can't. Because with that hook, I think he still sees himself as a pirate. And I know from "The Apprentice" that a part of Hook believes himself to still be unlovable and irredeemable. Nevertheless, he gets his hand back but Rumple warns him that the hand he receives is from his former self. You know, the one who wasn't a reformed bad guy and just, well, a bad guy. Rumple and Hook have a history together and Rumple doesn't need magic to manipulate Hook into believing that there is still some part of him that is evil. All Rumple needs in this episode, clearly, is a bit of psychology. Because he tells Hook (in fewer words) that the hand is evil, Hook begins to believe it is and -- therefore -- begins to act like it is. On the date with Emma, he loses his temper at Will Scarlet and then attacks the man at the library later on. What's really interesting is this: Hook is legitimately not a bad guy anymore. I know that some viewers will watch "The Apprentice" and believe him to be nothing more than a villain who changed in order to be with Emma but who is -- on the inside -- still as dark and self-centered as ever. But here is what I believe to be true: I believe that Hook acted out of a place of insecurity and fear. And when you act from that place, you always sabotage yourself and others. The whole reason that Hook wanted the hand was so that he could hold Emma, presumably, but there is more to it than that. Hook wants to be everything for Emma, everything that she deserves in life. He wants their date to be perfect because when you've waited for as long as Hook has, you can't imagine it as anything but perfect. Here's the kicker, though: Hook is so afraid of messing up that he sabotages himself in the process. When Hook angrily confronts Rumple after the date with Emma about his hand being cursed, Rumple admits that there never was a curse to begin with and he was simply revealing to Hook what was inside. But even THAT isn't true and Rumple knows it. No, you see, Rumple backed Hook into a corner by exploiting his weakness and fear (his weakness being Emma and his fear of never being adequate enough to deserve her or her love). What happens when you back a scared animal into a corner, readers? Ah, that is right: the animal attacks. And when an animal attacks, they lunge first and think later. So Hook lunges and makes a deal with Rumple and then tries to back out of the deal and winds up in a whole mess of trouble that could have been avoided within the episode's first ten minutes. Do I think Hook did everything right this episode? No. But do I think that he is a terrible human being? No. I think he was scared -- scared of whether or not Emma could love someone with a past like his, scared of ruining a date he's waited so long for, scared of his disability (a loss of a hand is a disability). I think that "The Apprentice" taught us more about Rumple's character, too: no matter what, Rumple will always see love as a weapon to exploit and use, just as he did to Hook and just as he (in the flashbacks) did with Anna. I hope that this show can turn the "reformed-bad-boy-makes-a-mistake-and-oh-no-will-the-woman-find-out-and-love-him-or-ditch-him" trope and make it less tropey (though Once Upon A Time isn't necessarily known for doing that) because I love Hook/Emma and their dynamic. I love that she -- Emma Swan -- didn't chase after a criminal on their date. I love that she is starting to fall for Hook the way he fell for her. I love that they both wanted the night to be special and that they went to great lengths in order to do so. I love that Emma wore a light pink dress because it made her feel special. I love that Emma has let Hook into her life and that she accepts him and (I believe) loves him, with or without his hand. I truly do hope that "The Apprentice" doesn't mark the beginning of an angst spiral for these two with the lying and cover-ups, but it appears we may be headed in that direction. If so... buckle up, kiddos. It'll be a whirlwind of a ride. No character in Storybrooke is pure of heart and I like that. Mary Margaret was too sweet -- she was too kind and good and fair and perfect. Perfect people bore me. Perfect characters bore me. Angels are wonderful in stories and, you know, the Bible but in television series, if a character is TOO perfect... they're unrelatable. Even those of us with the best of intentions mess up. We occasionally let a curse word slip or we gossip about someone or get angry. We are human beings and we fail to live up to the standards we set for ourselves on a daily basis. In "The Apprentice," we re-meet up with Anna who is about as pure-hearted and innocent as they come. And in the episode, Anna finds the answers she was seeking regarding her parents, but that knowledge comes at a price, just like magic. You see, in order to get information from The Dark One about her parents, Anna must first do his bidding. And his bidding involves making a man drink something that Anna is fairly certain is poison. She's sent to this Apprentice's cabin and... cannot go through with the deed. I love Anna, I really do. She's feisty. She's smart. She's goofy. She's lovable. But she's too good and "The Apprentice" reveals to us that everyone has a little bit of darkness within them that can be harnessed, given the exact right conditions. For Anna, that trigger is and was her sister Elsa. Elsa's love for Anna and Anna's love for Elsa is what grounded Frozen and what grounds them both as characters in Once Upon A Time. When Anna realizes that the assignment The Dark One gave her was a test to see if she could resist the temptation of darkness within her, Anna scoffs. She was never tempted. She knew from the moment she met the Apprentice that she could not tamper with his drink. Why is this so important? Because Anna is a good character... a NICE character. She's always been a bit insecure and naive and trusting because she sees the good in people, the lightness. Of course, The Dark One sees something within Anna, too: a trigger point. And when he presses her trigger point hard enough and insists that the only way to escape her binding contract with him and save Elsa is to kill him, Anna actually contemplates doing the deed. And her tears contain that power and are exactly what The Dark One Needs. There's a magical box that the Apprentice and his master guarded and this box could only be accessed by someone who has come face-to-face with the darkness within themselves and has managed to resist. That person, as it turns out, is Anna. But Anna is also cunning and resourceful and eventually uses those skills in order to win herself a one-way trip home AND possession of the magical box that can absorb magic and make the user harness it all (spoiler: the magical box turns into Mickey's Fantasia hat, so). Anna learns the truth about her parents, too, namely that they were afraid of Elsa's powers and wanted to retrieve a way to remove her magic. The only question is now this: what will Anna tell Elsa? Where "The Apprentice" intersected A and B-plots is the moment that Hook and Anna began to question who they were and both were surprised at what they discovered. It is super important to note, however, that BOTH of these individuals arrived at their respective self-evaluations due to emotional manipulation by Rumple (a character I've found myself liking less and less as the years go on). Rumple was the one to plant the idea in Hook's head that he was still a villain. Rumple was the one to abuse the preexisting feelings self-doubt that plagued our favorite reformed pirate and use them for his own personal gain (in this episode's case, to track down the Apprentice from our flashback story and trap him in the magical hat). Rumple was the one to cast doubt on Anna's character -- he was the one who poked and prodded her trigger point until she broke. Hook and Anna's actions weren't results of any deep-seeded character flaws: they were reactions of living, breathing HUMANS. Humans, when backed into a corner, are scared and vulnerable. Humans, when forced between the person they love and a rational choice, will usually choose love. Because love is powerful. Love is magical. Love is a strength... until someone exploits it and manipulates it into something evil. Then it's not love, anymore, it's control. Rumple knows how much Hook love Emma and how easy it is to cause him to doubt himself, to act in anger, to be afraid. Rumple knows how much Anna love Elsa, how self-sacrificial the sisters are, how far Anna can be pushed until she lunges back. Cowards use love as a weapon and these days, I don't see the powerful, mystical Dark One when I look at Rumple. I don't even see a reformed man. I see a coward and a fraud and a bully who uses the most pure feeling in the world as a something to be used for harm against others and personal gain, not to better the world or residents of Storybooke. And that is the honest truth. There was a barely-there C-plot where Regina and Henry tried to figure out how to save Marian and who wrote the storybook. Spoiler alert: They didn't get very far with either. "You know how to chase a monster. I know how to plan an evening out." "Oh, I see blackmail brings out the romantic in you." I didn't get to mention it above, but Snow and Charming got to play overeager parents sending their daughter out on her first date AND waiting up for her. It was delightful and I really want them to keep this dynamic instead of forcing us to watch as this duo runs Storybrooke into the ground (or into the waiting arms of another mob). Lady and the Tramp in human form were at the restaurant! Emma wearing Hook's jacket after dinner, though. ALSO HOOK WAS IN MODERN CLOTHES. Let's just get Ichabod Crane from Sleepy Hollow in some new digs and we will be good to go. "You want to come in and have coffee... with my parents, a newborn, and a human ice-maker?" Emma really needs her own place, as was stated about four times this episode. I hope she will actually get one because she legitimately sounded like an exasperated college student whenever she mentioned it. "Love IS a weapon, dearie. Always has been." No one in Storybrooke has learned that magic comes with a price, which is ironic seeing as I thought that was literally the town slogan. The radio Easter egg was BRILLIANT. "This is for Mr. Rip Van Winkle who's looking for something classic to wake up to." Slow clap, show. Slow clap. The Fantasia-esque score was wonderful. The dancing broom... was a bit much. We get it, guys. WE ALL GET IT. "I was gonna say 'bad.' But, yeah, what you said." Storybrooke apparently still uses video tapes. Out of everything in this show, THAT is what I find to be most unbelievable. The promo for next week had the Snow Queen (I always nearly want to type Dairy Queen) saying: "I'm going to build a snowman," and I cringed so hard at the cheesiness.